Not all Android apps are created equal, and most are far from perfect. And I'm not just talking about all of the unpopular, unmonitored apps that flood Google Play and often end up being ousted because they're spammy or malicious. Even popular apps from respected companies are often guilty of draining your battery, shilling for (paid) updates, and spamming your notification bar with ads. Here are more than a dozen popular apps that offend in various ways. Instagram made its Android debut just a couple of weeks ago, but the app isn't perfect. One major issue is that the default notification setting is to spam you with updates whenever one of your contacts joins Instagram. Not when they follow you, just when they join. You can disable this by going to: Instagram, Settings, Edit Profile, Manage Settings, Push Notifications, Contact Notifications. Yeah, they really make it easy. Glu Mobile's free Gun Bros. is packed with fast-paced action and spammy ad notifications. The game uses alerts (similar to, but not, those from the Airpush ad network) to constantly pester you with promotional material--from Gun Bros., at least--in your notification bar. You can turn off the Gun Bros. ads in the Settings menu. Apps that use tons of data get a bad rap, perhaps unfairly--after all, you can't make a streaming video app that doesn't use tons of data. Still, Netflix is the major offender in this category. In fact, Netflix is such a data hog that even landline Internet providers are trying to put a cap on it. Netflix data consumption varies, because Netflix constantly adjusts video quality to keep up with your connection speed. But in our tests, streaming Netflix for just 10 minutes over Verizon's LTE network used between 100MB and 200MB of data. Rovio's Angry Birds is uber-popular, especially on Android, where the app is free and ad-supported. But those "free" ads can cost you--in battery life, according to a new study by Purdue University. The study, which was performed in collaboration with Microsoft, claims that third-party advertising in free apps can be responsible for as much as 75 percent of an app's battery consumption. The researchers looked at Angry Birds and found that the core gaming component consumed only about 18 percent of the app's energy, while 45 percent of the app's energy went to third-party ads and analytics. VZ Backup Assistant, a preloaded Verizon app. Annoying apps are one thing, but at least you can remove them--most of the time. But if they come preloaded on your device, your carrier likely doesn't want you to do any such thing. Verizon phones, for example, come preloaded with My Verizon Mobile and VZ Backup Assistant, and there's nothing you can do about it. Unless you have Android 4.0 (Ice Cream Sandwich), that is. 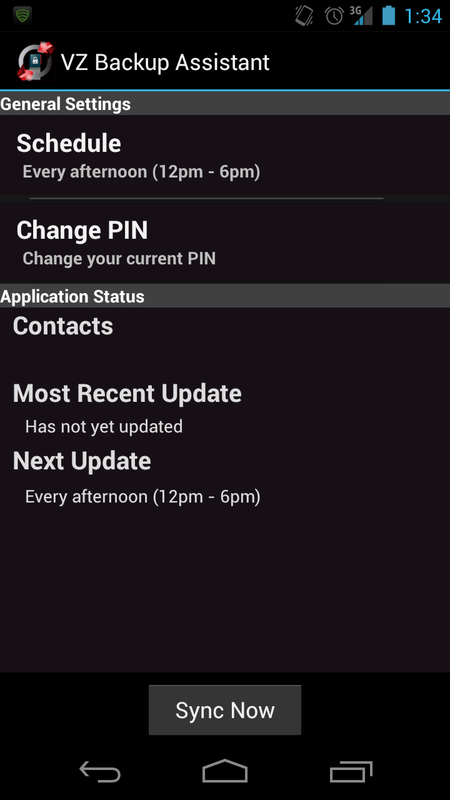 In ICS, you can disable and hide any system app (but you still can't remove it). I like free apps. I also like paid apps--if I think they're worth my money. I don't even mind freemium apps. But I do take issue with "freemium" apps that basically require an in-app purchase. Spry Fox's popular puzzle game Triple Town is one such app. Don't get me wrong--TripleTown is fun, polished, and super addictive. But you get only a limited number of free turns, which replenish ve-e-e-ery slowly after you run out. You can purchase unlimited turns for $4, which isn't a bad price…unless you were hoping to play the game for, well, free. I get it, indie game developers have to make money, but I would rather that they just charge for the game up front. Social networking is all about being constantly connected to your friends, both real and virtual, right? But it's hard to stay connected on the world's biggest social network when Facebook for Android constantly crashes. Yep, just about every time I open Facebook for Android and use it for a few minutes, it will inevitably freeze and pop up a little message that says the app has stopped working. And I'm not the only one--check out the less-than-stellar reviews on the app's Google Play page. JQ Soft's MySettings is a free widget app that lets you place toggles on your home screen for various system settings, including Auto Rotate, Airplane Mode, Network Mode, Flashlight, Bluetooth, and Unlock Pattern. Unfortunately, this app is ad-supported--and the ads are delivered via Airpush, to your notification bar. Not only that, but they're especially spammy ads: Users can look forward to a barrage of messages such as "You won an iPad2!" Hangouts feature of Google+ may be a cool idea--video chatting with multiple people at once--but it can cost you some serious data. In our tests, Google+ Hangouts chats ate up 30MB per 2-minute session, which is about six times more data than Skype uses. So if you're a video-chat junkie, it's probably better to chat with just one person at a time. If you use Google Maps only occasionally to glance at directions or look up addresses, you won't notice a major battery life hit. But if you use it obsessively, you definitely will. Google Maps drains battery life through many channels: Back-up processes, location services, and turning on satellite GPS (instead of using wireless network GPS). If you've recently gotten a new Android phone, it's very likely that your friends had some advice for you: Download Advanced Task Killer and your battery life will thank you! Well, as it turns out, Advanced Task Killer is totally overrated--at best, it offers up a measly improvement of around 4 percent battery life (which gives you about 15 extra minutes); but at worst, it actually lowers your battery life, albeit not by much (around 2 minutes). Generally, all this app really does is sit on your home screen and make money for its developers. Some apps, like Path, want your contact information. 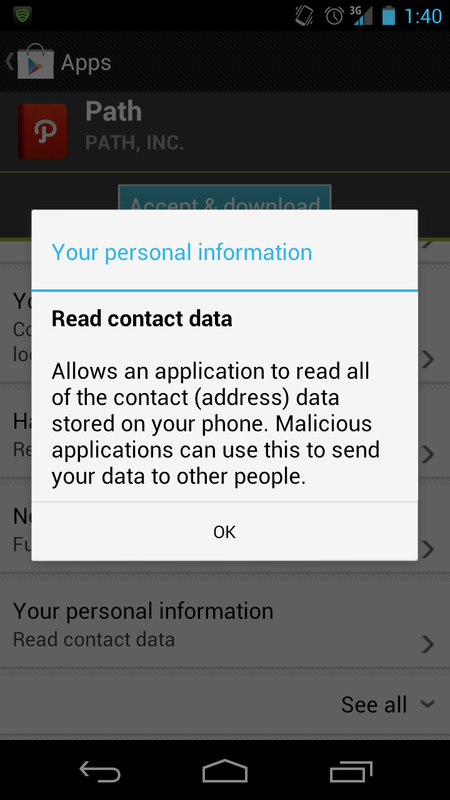 The Android platform is notorious for having, ahem, lax security procedures. In other words, the OS is ripe for getting hit with malware. One of the major issues is that too many apps are unnecessarily bold when they ask for permissions. For example, do apps such as Path, Instagram, and Yelp need constant access to your contact information? Probably not. Does the game Tiki Cart 3D need access to your location? Does Angry Birds Space need to be able to access the phone features of your device? Not really. But you agree to let all of these apps have those permissions when you download them. If you want to check what permissions apps want on your Android device, download Avast Mobile Security, a free app that lets you view apps by permission. UPDATE: An earlier version of this article named the app Foodspotting among apps that required constant access to your contact information. Foodspotting for Android does not access contact information at all, while Foodspotting for iOS only accesses contacts with user permission.